With the I Am Music II tour making a stop in Vancouver on Wednesday night. Nardwuar ‘The Human Serviette’ who calls the Canadian city home, had the chance to interview Lil’ Wayne backstage. The two talk his first rap name being Shrimp Daddy, his lapdance vs. Steve Nash’s lapdance from Nicki Minaj, his love for Nirvana, remembering Birdman’s pager and office number, memories of a young DJ Khaled at Odyssey Records, the significance of his ’07 collabo with Curren$y titled “Trigga Man” and plenty more. Rihanna and Michael Clinton (of Hearst Magazines) were honored for their charity work in the fight against leukemia at the 5th Annual Gala for DKMS, the largest bone marrow donor center. The black-tie gala, tonite at Cipriani’s in the Financial District, was hosted by DKMS’ Katherina Harf and featured Pharrell (as master of ceremony), Mary J. Blige, and a special performance by “The Lion King” in honor of Shannon Tavarez, the 11-year-old castmember who died last year of leukemia. Attendees tell me there wasn’t a dry eye in the house during that part, as well as when a donor and patient were reunited on stage. Check out Rihanna, Pharrell, Iman, Solange, Leighton Meester and more in their black-tie finery…. Watch Rihanna’s recent bone marrow donor public service announcement…. Tyler, The Creator aka Thurnis Haley returns in the latest viral promo for his upcoming solo album Goblin. Watch his alter-ego as he talks his love for golf at an undisclosed ‘country club’. Catch the album when it drops on May 10th. MMG’s latest vlog takes us to Texas, where we get our first sight of the latest addition to the label, Stalley. During the I Am Music II tour stop in Houston Ross brings out Trae The Truth to perform their collabo “Inkredible” and Meek Mill ends things off with “Tupac’s Back”. Check out vlog #5 after the jump, where the tour stopped in Oakland with appearances from Travis Baker, E-40, and Too $hort…. Looks like French is pushing this as his next single with a video coming soon. 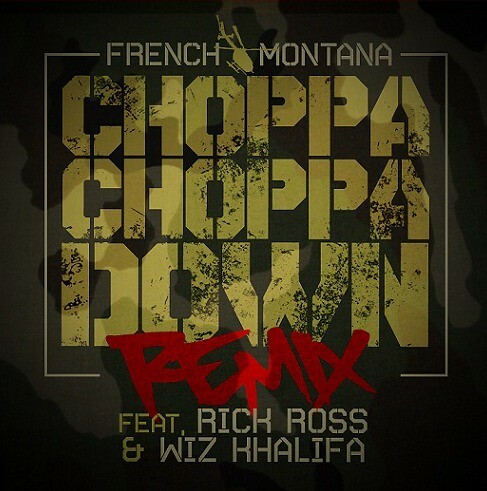 So with Gucci’s recent troubles he’s replaced by Rick Ross on the official remix to “Choppa Choppa Down”. Much more from CJ Hilton feat. Nas, Untitled feat. Ludacris, T Lopez feat. Lil’ Wayne, Yo Gotti, Spliff Star feat. Fat Joe, Jon Connor, Emilio Rojas, and Black Rob, after the jump…. UPDATE: Thanks to everyone who participated! Congrats to Jebreh and Patrick! The advice was honest and very helpful. Honestly, even if you aren’t in the area, I’d still welcome your complaints. Whoo Hoo! I’m super amped for this show on Saturday in NYC. Spring weather, great venue and a true friends and family lineup….Atrak, Fool’s Gold Records, Pusha, Malice, Kid Sister (Never met Gaslamp Killer but big up y’self too, lol). -Email MissInfo@MissInfo.TV with your full name, email, and phone. Good luck everyone! 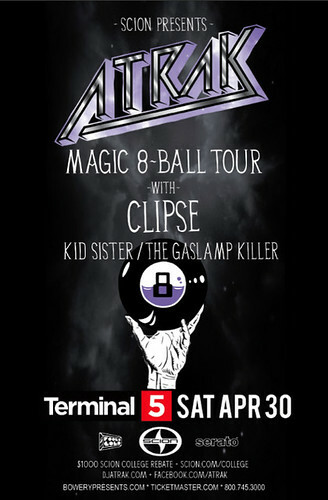 I’ll pick two random winners but if you want a sure thing, just buy your “Magic 8-ball Tour” tickets online at Terminal 5 now! Now I don’t co-sign every record this kid puts out or everything he reps, but he def has some bars and is doing the damn thing in hip-hop And, I know this video prolly belongs on that wretched site that posts all the f*ckery … but I’m dying in laughter right now. Here’s Odd Future’s Tyler, The Creator acting a fool at the XL Records in London. BALLER A** SH*t ! Unrelated but kind of related: Tyler’s boy crush stepped onstage with Chris Brown last night and ripped Busta’s verse from “Look At Me now. Some hip-hop dudes are interested in strippers and rims, but for Pharrell outer space and saving the planet rank just a littler higher in life. Recently, N.E.R.D.’s lead singer paid a visit to Nasa for FOHTA‘s STEM initiative event. Skateboard P is currently working on establishing the Pharrell Williams Resource Center, a place to “inspire and educate” children around VA.
BTW, his partner Chad Hugo recently worked on a new mix for Fools Gold’s Foolcast, Eskay got that.